911uk.com - Porsche Forum : View topic - Revealed: the new 911  Speedster! 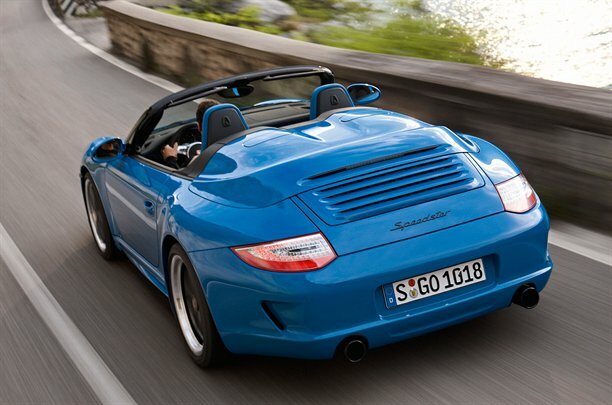 911uk.com Forum Index -> 997 (2004 - 2012)> 997 FAQ > Revealed: the new 911  Speedster! Posted: Tue Sep 21, 2010 6:33 am Post subject: Revealed: the new 911  Speedster! Last week the 911 GTS, this week the 911 Speedster. Anyone would think Porsche was having difficulty flogging 911s at the moment, so is coming up with ever more inventive ways of shifting metal. Just 356 examples of the Speedster are being made available worldwide – as if you needed another clue to point you to the fact this car aims to recreate the spirit of the original 1953 356 Speedster. Porsche is heavily into plundering the back catalogue at the moment: this year we’ve already had the Boxster Spyder reliving the 550 Spyder and the 911 Sport Classic doing a ducktail impersonation of a 1973 Carrera RS. The 911 Speedster uses the same 408bhp engine as the Sport Classic – and come to think of it, the 911 GTS. It’s also rear-wheel drive, has the PDK gearbox as standard and uses the 44mm wider Carrera 4 body. In Porsche’s own words it’s been ‘designed and conceived by the Porsche Exclusive department in Stuttgart’, to help celebrate that arms 25th anniversary next year. Before you go thinking this is a good thing, Porsche Exclusive does all the personalisation stuff, not the RS stuff. Two seat only, it has a 60mm lower windscreen and the iconic double bubble humps at the back. 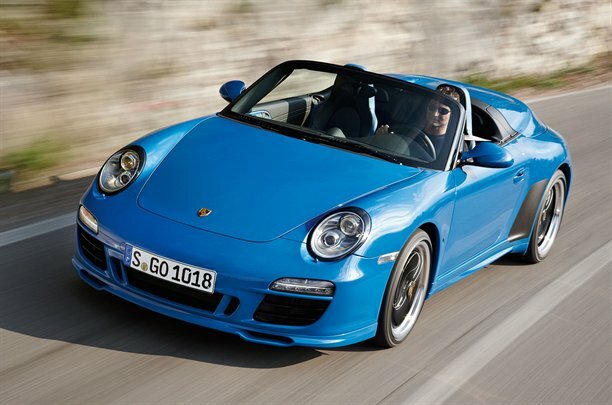 Unique Pure Blue paint is standard, but you can have yours Carrera White for no extra charge. Like the £137,900 Sport Classic, the Speedster will wear an equally hefty price tag when it goes on sale next January at a cost of £144,100. Porsche has resurrected the 911 Speedster 16 years and three model generations after it last featured in its line-up and a hotter, turbocharged version could follow. The new car is just the third 911 Speedster to be placed into series production and it follows tradition by being based on the existing cabriolet version of the model. Paying homage to the car that kicked off Porsche’s fascination with the chopped-top look — the 356 Speedster, launched in 1953 — the new 911 Speedster uses standard bodywork but receives a 60mm shorter and more heavily raked windscreen than other 911s. A plastic tonneau cover behind the cabin also receives a double-bubble treatment reminiscent of that which graced the first 911 Speedster in 1988. The overall appearance is further enhanced by the adoption of the widened rear bodywork of the latest 911 Carrera 4S cabriolet, with its 44mm wider wheel housings. A flat, manually operated fabric hood is designed to provide some protection from the elements, although it is unlikely to be as sturdy as the standard 911 cabriolet’s automatic roof. Created to celebrate the 25th anniversary of Porsche Exclusive — the company’s in-house personalisation programme — the latest 911 also receives an additional chin spoiler at the base of the front bumper, tinted indicator lamps, blackened headlamp surrounds and windscreen frame, unique side sills and a rear bumper with 911 GT3-style air vents behind the rear wheel arches. Inside, there is a combination of black leather and colour-keyed elements taken from the Porsche Exclusive catalogue. Power for the 911 Speedster comes from the same 3.8-litre motor that was unveiled last week in the 911 Carrera GTS, with 402bhp and 310lb ft. But insiders say Porsche could follow the original 356’s plan by introducing a Super Speedster shortly after this car’s launch; it would probably use the 911 Turbo’s powerplant. Standard equipment on the Speedster includes Porsche’s seven-speed PDK dual-clutch gearbox, a locking differential, adaptive damping and carbon-ceramic brakes. Where's the Like button here? Looks great, cant help thinking our Graham inspired them on this one! Strange, I think I like it but Im really not sure! 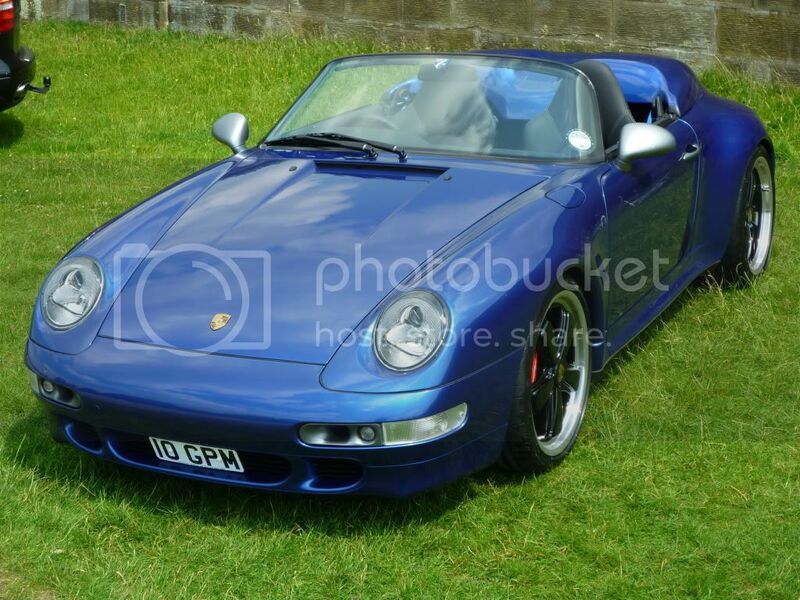 I love the sport clasic although cant see how the asking price was calculated! I love the colour of the speedster but there are just "bits" that I cant just "get". 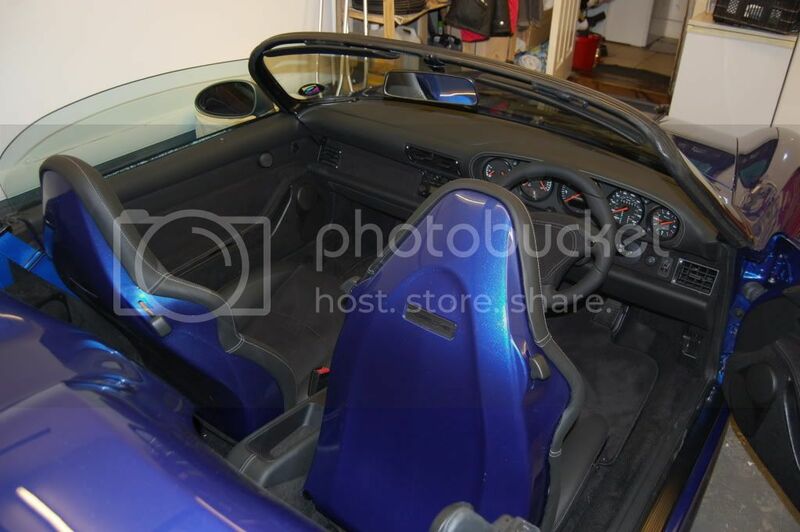 I suppose If I saw it in the flesh it may be different The Chequered seats? 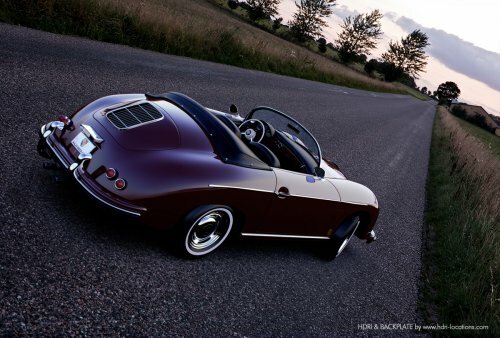 What I do find harder to swallow nowdays is the "hommage" to the original 356 speedster - Its just so far removed from that ethos. The original was a lightweight version of the coupe ,where this lastest incarnation feels to me to be just so not that..
You know they will all sell very very quickly, and like I said If I do ever get to see on in the flesh It maybe very diffrent but even if the prices were the same I think Id take a GT3/RS over it. Or better still a GT3/RS Spider!! 993 C2s black on black. Interesting to see how the Turbo is very much middle of the range now. 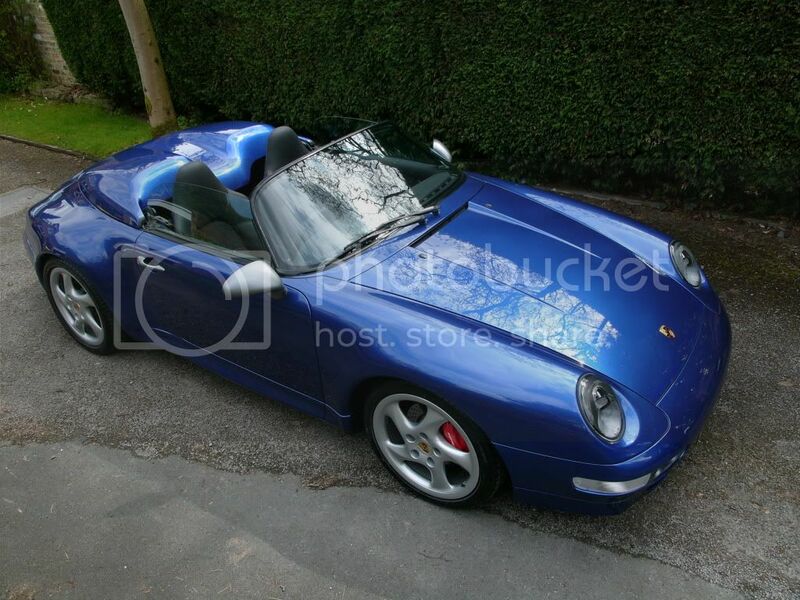 And that last one looks ridiculous....who'd have blue wheels on a top of the range 911??? Sorry, you're right no 997 GT3 RS SPYDER, my mistake, it was actually the 997 GT3 RS CABRIOLET I saw. My favourite model is the one with the Mach3/Quattro blade fixed wing, blue wheels or not. Like it, but still looks a little practical! Another 3-4 inches of the screen to make to more rakeish would look a lot more retro. Just cant think where they got the inspiration from!! dose that mean Hilda is paying homage to Jane?? That reminds me, I must get my bike out of that bike rack. Graham, in a nutshell, the question is: would you exhange yours for this? I'm loving this new Speedster but of course, as already mentioned, silly price. What makes it worse, you were the FIRST reply!